Few things can approach this. 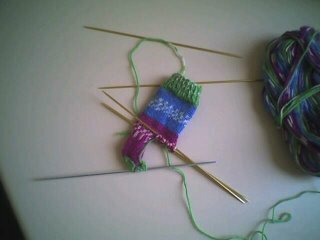 This is a sock for a dainty little four year old (her foot is tiny – not much bigger than my two year old’s). This is the knitting equivalent to instant gratification. About two hours to get to this point. Very pretty sock, what's the yarn? I'm assuming it's self-patterning from what I can see of the skein. This is from KnitPicks (the cheap knitter's choice), and is called SweetTart...the colors are indeed just like a SweetTart package!